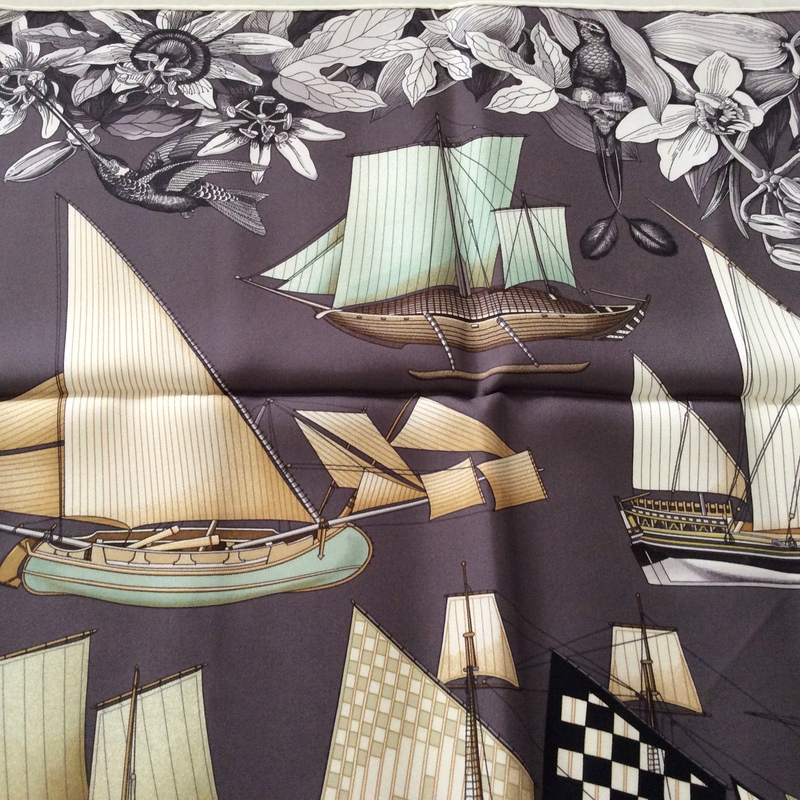 Today I want to show you two scarves that have boats as their theme. They are very different, but both happen to feature boats and birds. It is a long post (to make up for last week! 😉 ) and rather picture-heavy, so I hope you stay with me! 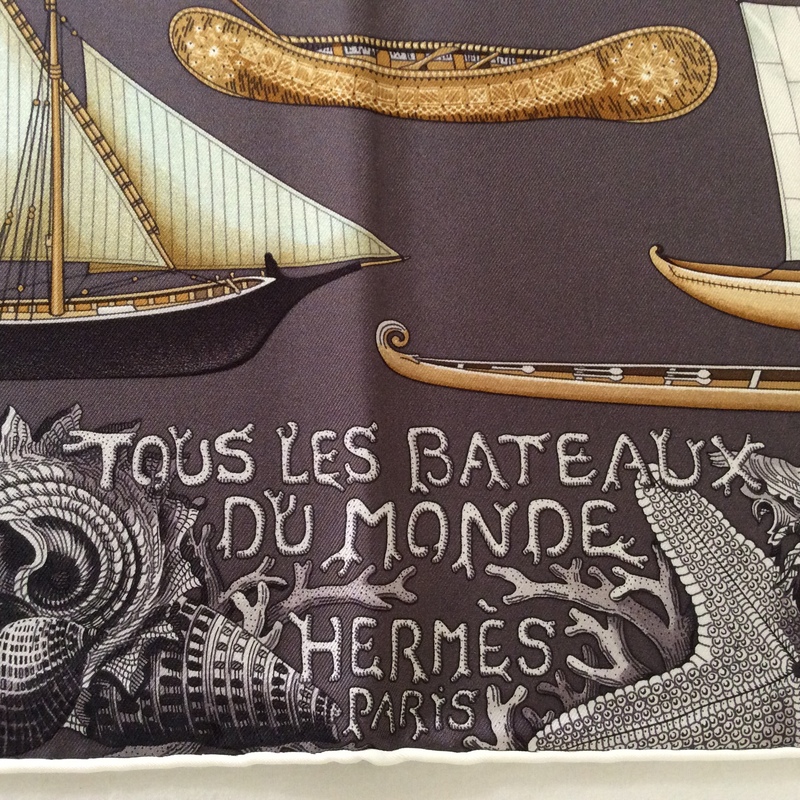 Tous le bateaux du monde (all the boats of the world) was designed by Aline Honoré. The title of the scarf is written on the bottom center of the border in what looks like corals. 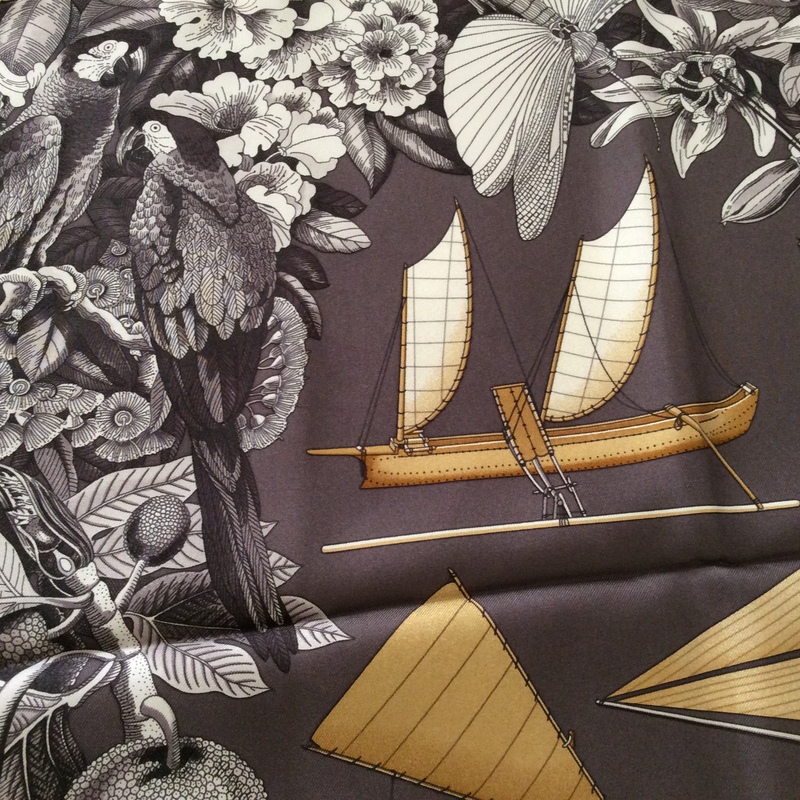 Honoré is famous for her intricate drawings of plant and animal life, and despite the boat theme, she managed to insert her favorite kind of illustrations on the border of the scarf, thereby combining two rather different themes into a harmonious whole. 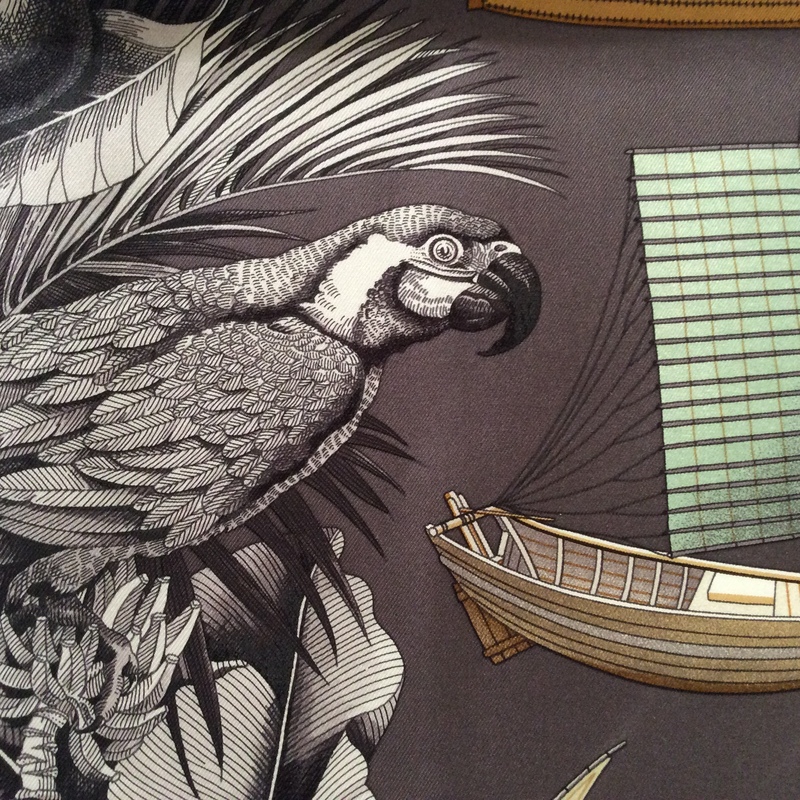 The more graphical sail- and rowboats are bordered by a wild jungle full of hidden creatures, birds and monkeys sitting in the lush vegetation of a flowering thicket. 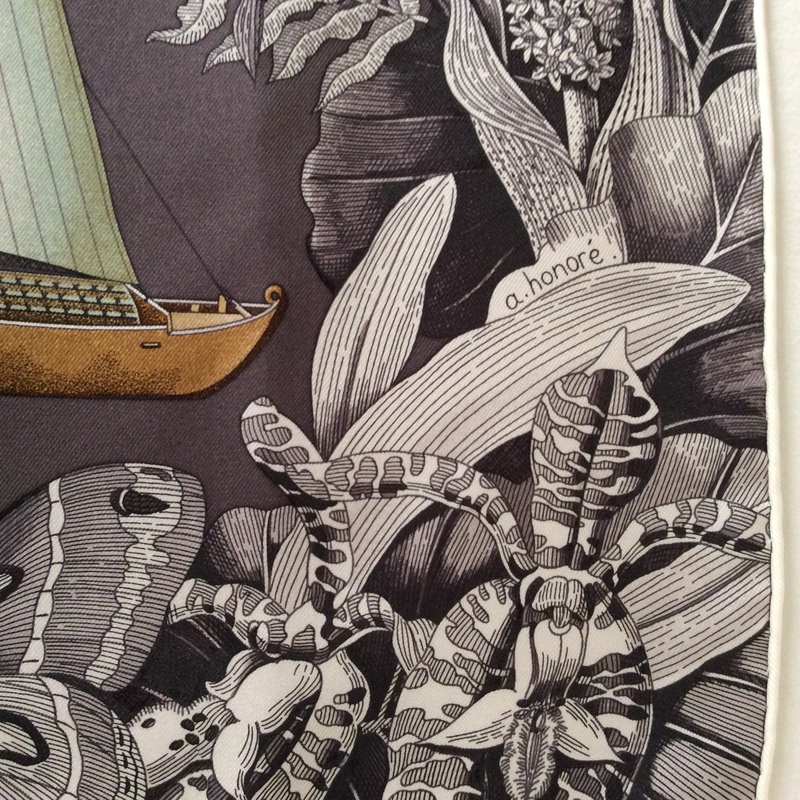 The trick is to keep the border in black and white as to not overwhelm the eye and letting the boats shine and take center stage (quite literally) while the jungle acts as enhancement and subtly draws the eye. 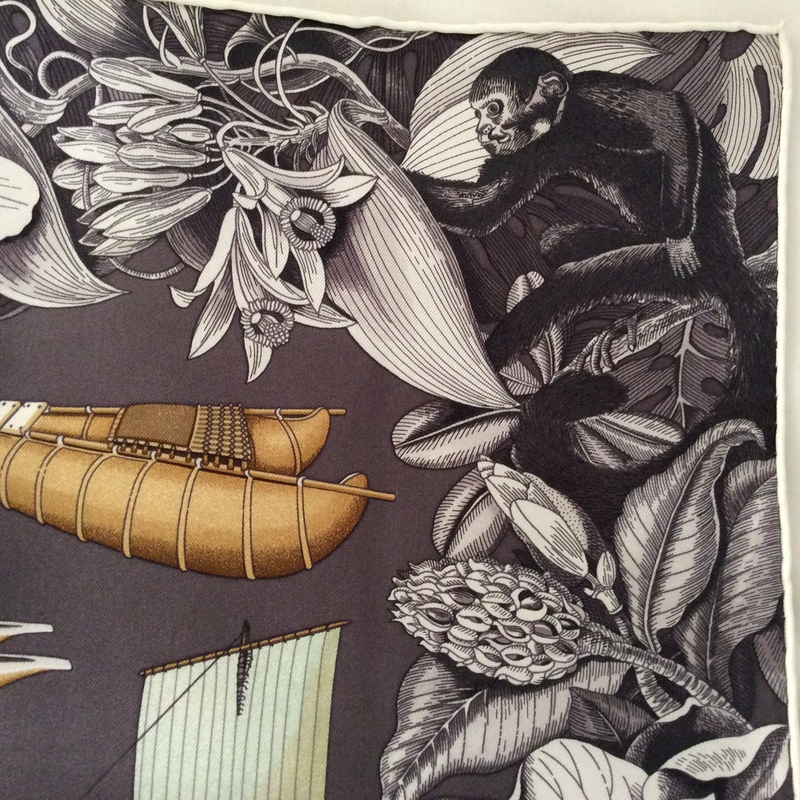 As always when folded, the picture changes and the border is way more prominent, we get to discover a monkey or a parakeet when we initially thought this was all about boats. I initially chose Tous le bateaux because of its fabulously neutral colours, I figured the taupe background and black and white border would go with everything and be elegant to boot. I was right about that, but the reason I love it now is the ingenious way I always find a new detail to admire every time I wear it. Can you imagine that I didn’t even see the monkey in the upper right corner until my son pointed it out to me one day? We can be so blind to the beauty around us and forget about details by always looking at the bigger picture, which is something children never do. They see the small things much better than we can and I’m glad having help in discovering them. Aline Honoré’s signature is in the right bottom corner of the scarf amid the vegetation. The second scarf of the day is a special one (I know I say that about many of my scarves, but isn’t that the beauty of it?). Let me tell you the story of this one. When my dear friend Tara was in Vienna in March, we went into Hermès (duh!) and she wanted to look at some scarves. I was under the impression that she was looking for herself and so I tried to find something to suit her. She on the other hand was stealthily trying to find out what would be my favorite among the options we saw. When she got me to state my choice, she picked it up and told the SA to wrap it up as a gift to me. So you see how special both this scarf and Tara are! This scarf is called Bateau Fleuri (Ship of Flowers) and was created by Ljubomir Milinkov. This is what Hermès says about the design which was released this spring season. I want to show you a few details of this scarf as well. Above is the name of the scarf and small blue butterfly over the main background of wavy ocean. 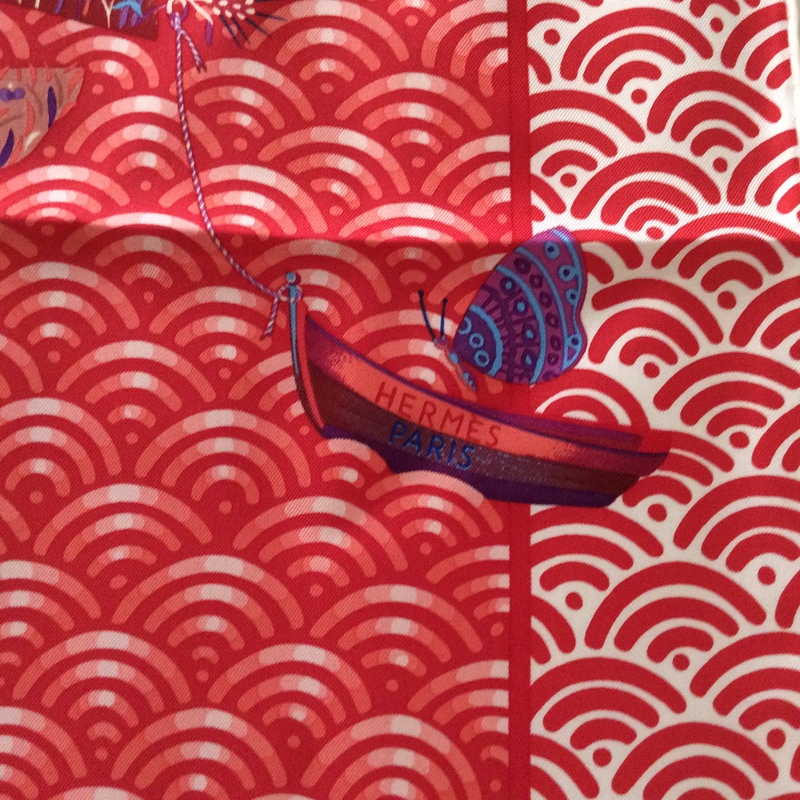 A small row boat bears the Hermès logo. …and this one is high up on the top sail. 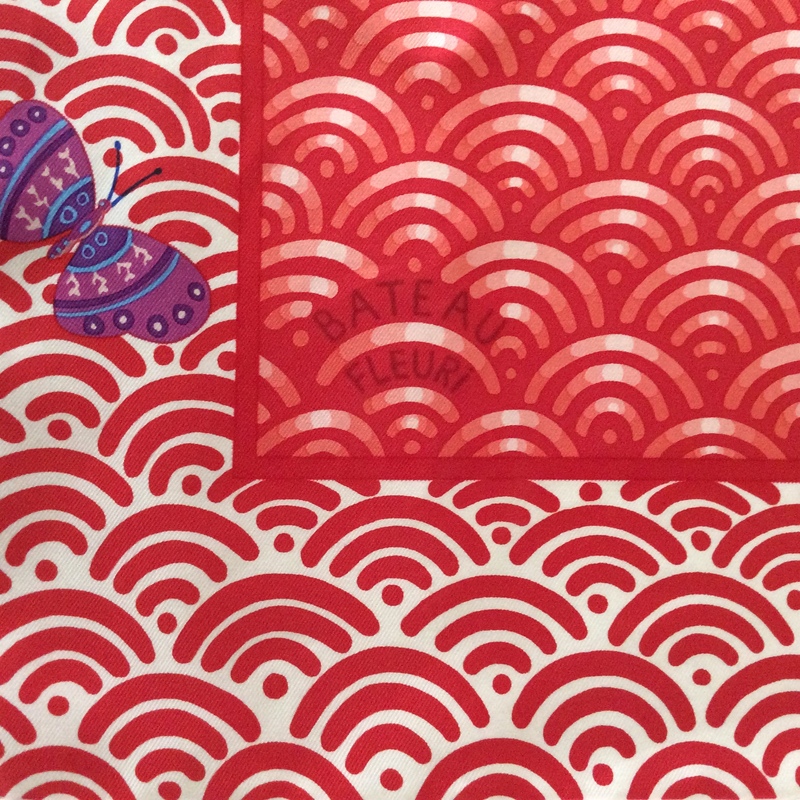 When folded like you see above, the waves (that remind me of Art Deco fabrics) are most prominent, but if you hide the ends, like in the photo below, you get the sails of the ship, inlcuding more colours than the dominant red. 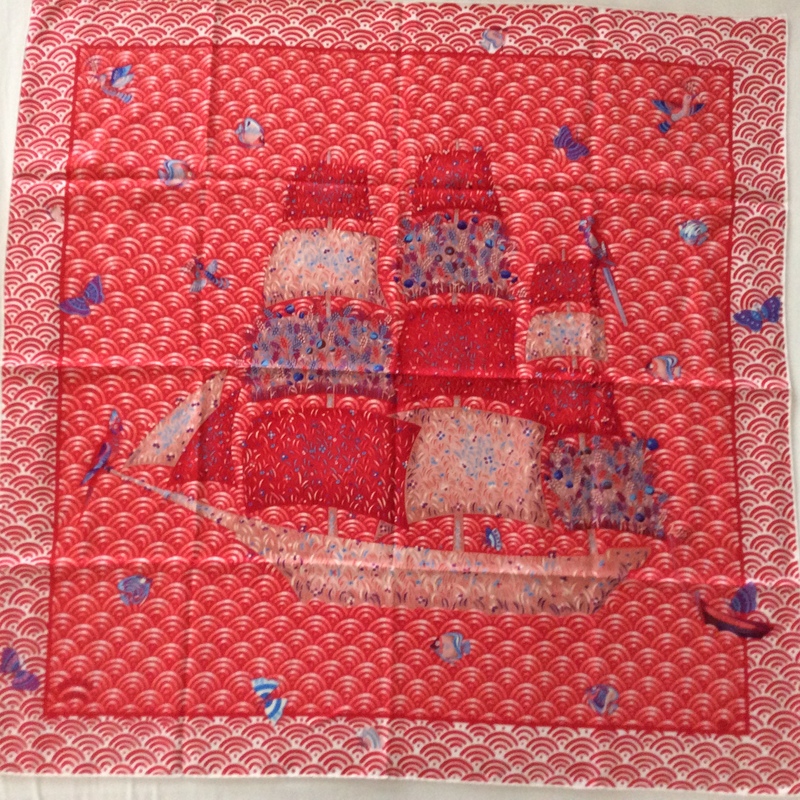 The sails are pink, powder blue and a dusty greyish lilac. This scarf makes me smile. 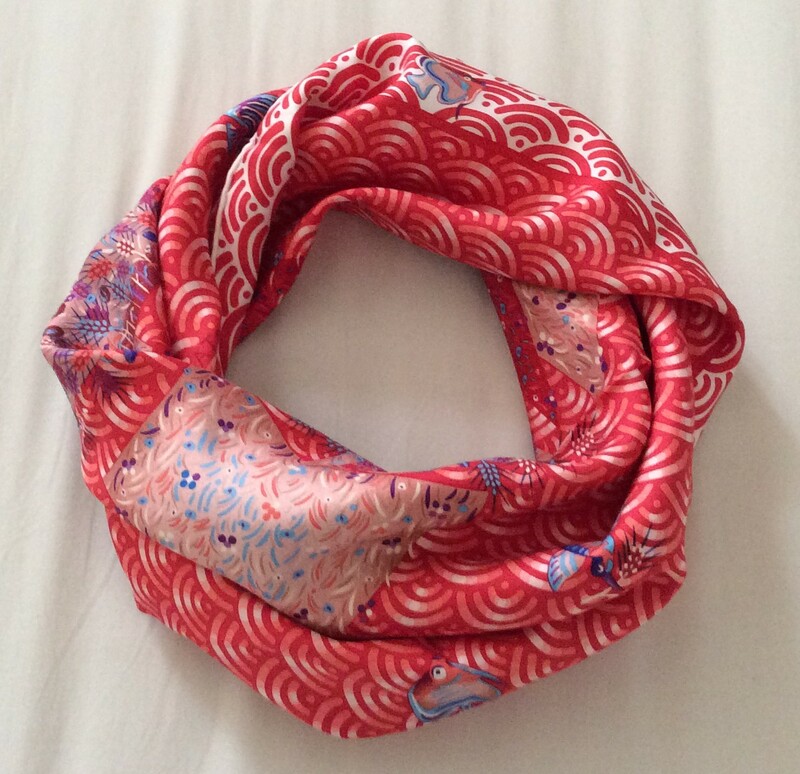 It is not only a pretty scarf but a reminder of a wonderful friendship across an ocean (well, the channel counts!). 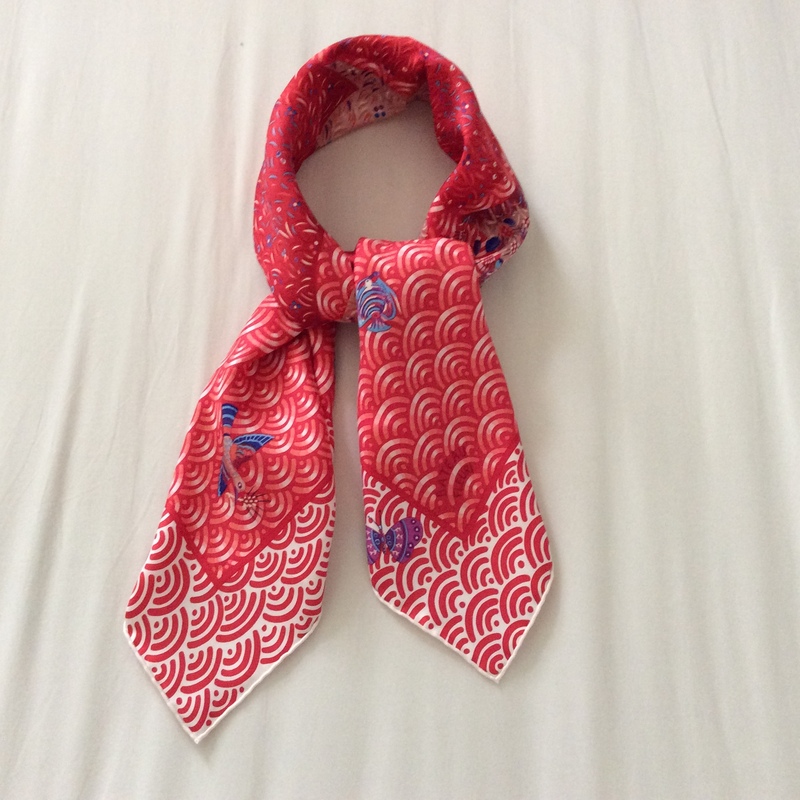 This entry was posted in Hermès, Scarf Collection, Scarves and tagged Hermès scarves, Hermes, scarf collection, Silk scarves. Bookmark the permalink. Thank you, Johano, glad you enjoyed this. One of the great things about these posts is getting to see all those little details. I love the parakeets! I also enjoyed reading the background to the design of Bateau Fleuri. “Like a wandering, waking dream…” is so poetic and perfect. Very happy you included a pic of you wearing the scarf because it suits you so well. I loved that that lady complimented you on it while we were at Café Stein. is worth a look too. He is great! Beautiful scarves B! You also photograph them nicely so that we can see the details. Have a good weekend. How lovely! I always enjoy seeing these incredible works of art in your Friday posts, and your photographs are exquisite. Thank you! i love the scarf series! And I just bought 2 oats by Schneiders of Salzburg.I wanted something a bit more elegant. I love both of them-a shorter blue coat, and a longer Logan style coat that has the most amazing lining-sheer green silk that flashes lavendar in the light. 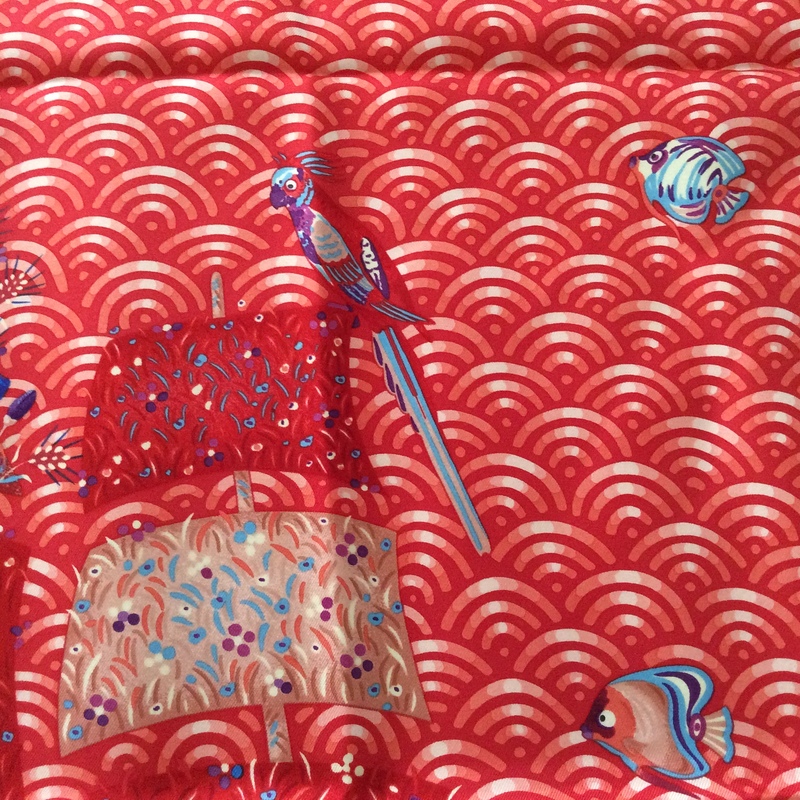 Congratulations on your new acquisitions, that lining sounds beautiful, Carole! It is so wondrous to see these artful bateaux. I love the birds, butterflies, fish, and flowers as well. They add life to each scarf. I showed my son the birds as he loves his parakeet pets. He thought the birds on silk were amazing. He made me laugh when he noted the Bateau Fleuri background motif. He said it was clearly the same as the “wi-fi” symbol from his iPad. Thank you for sharing your stories and images! So happy you enjoyed the details of these scarfs. Thank you for your comment! WOW! Lucky you Birgit. What a perfect gift for you. CLEVER Tara. I love how they hide the Hermes and the name of scarf & artist, so cool. Excellent info, thank you very much. Nina Z. 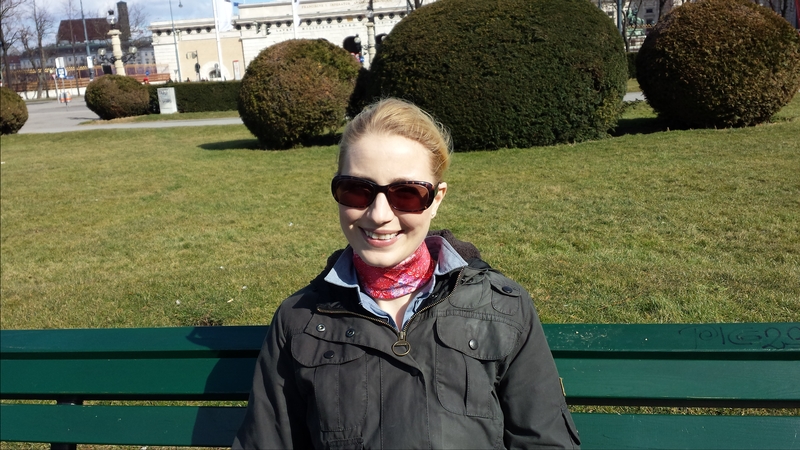 Beautiful scarves, Birgit – and what an incredibly thoughtful gift from Tara! Lovely to hear about them both. Very much enjoyed the review! Not long at all and the pictures are so vivid and beautiful! The first “bateau” impressed me more. I find the contrast between the somehow geometrical boats and the lavish vegetation rather fascinating. 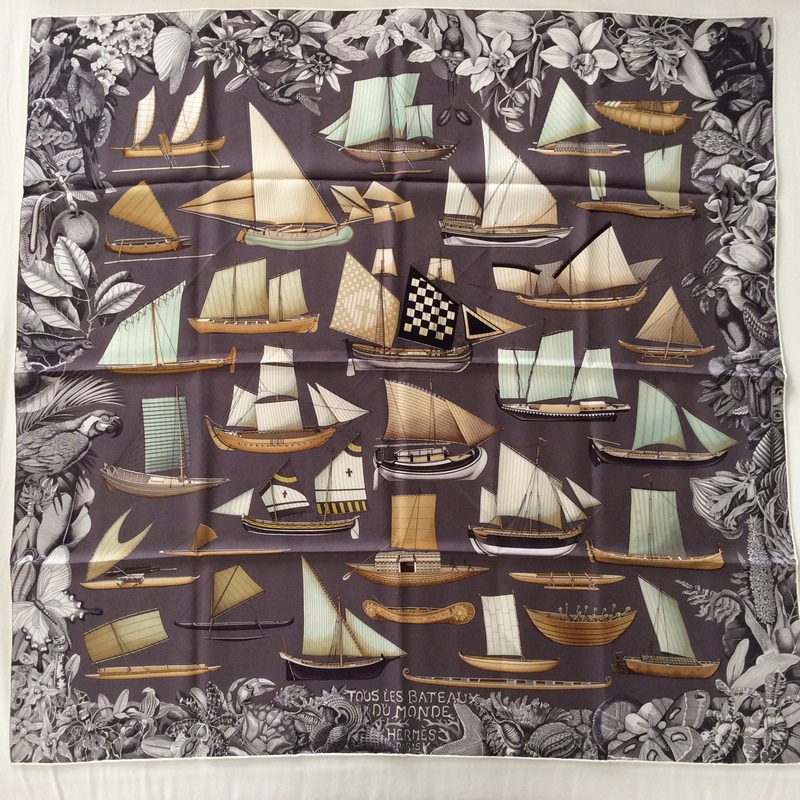 What a gorgeous pair of boat-themed scarves! 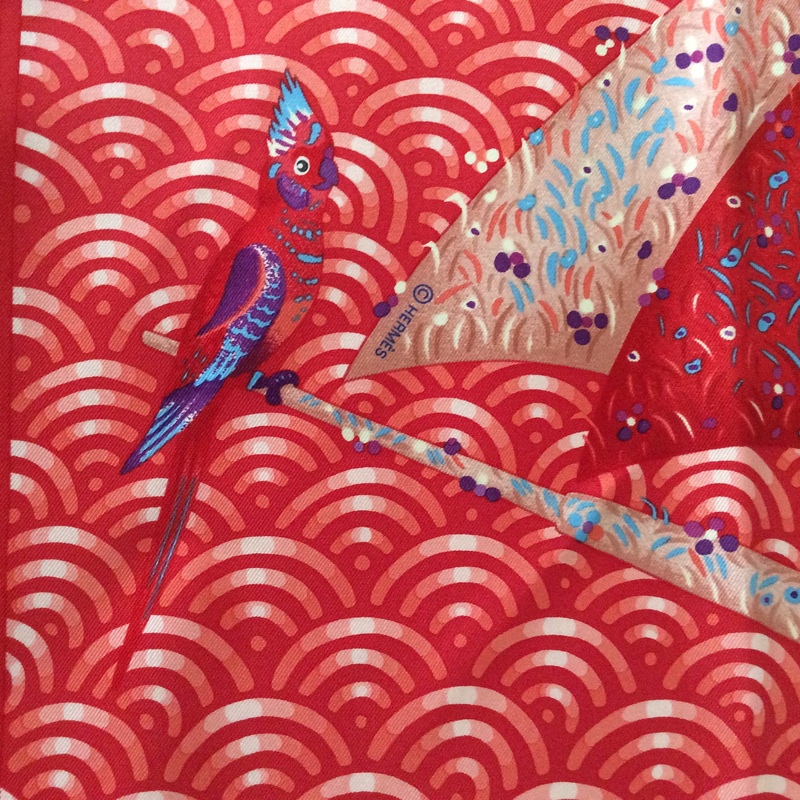 I loved homing in on all the detail – especially the parrots and that cute butterfly in the boat on the scarf that Tara gave you. I also think you are clever to work out the different ways of wearing the scarves to highlight various motifs – love the Art Deco waves on the red one in particular – a bit reminiscent of the packaging of Juniper Sling or the Chrysler Building. And what a lovely reminder of Tara’s visit – such a thoughtful and generous gift for her holiday host!